among these genes in accordance with the specific color the gene. For each characteristic, an organism inherits two alleles, one from each parent. This means that when somatic cells are produced from two gametes, one allele comes from the mother, one from the father. These alleles may be the same (true-breeding organisms, e.g. ww and rr, or different (hybrids. e.g. vi:r in Fig. 3). If the two alleles differ, then one, the dominant allele, is fully expressed in the organism’s appearance. The other, recessive allele, has no effect on the organism’s appearance. In other words, the dominant allele is expressed in the phenotype of the organism. The two alleles for each character segregate during gamete production. This is the last part of Menders generalization. The two alleles of the organism are separated into different gametes, ensuring variation. During his experiments, Mendel encountered some traits that did not follow the laws he had encountered. These traits did not appear independently. They always came together with at least one other trait. Mendel could not explain this. So he did not mention it in his work. Today, we know that these traits are linked on the same chromosome. 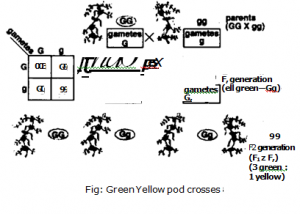 I. F, cross: Mendel crossed two true breed parental generations of green and yellow pods. He obtained green pods in F1 It means that green pod is dominant overt yellow pod. Test cross: Then Medal test crossed the green pod plants. He found that 283 green pod plants produced green and yellow pod in 1:1 ratios. But 144 green produced only green. 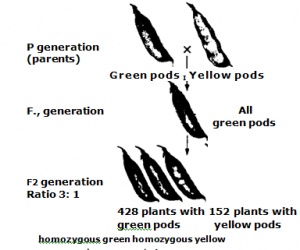 It means that 283 plants were heterozygous green pod and 144 were homozygous green pod. Thus the phenotypic ratio of F, is as: I (homozygous green): 2 (heterozygous green): 1(homozygous yellow). 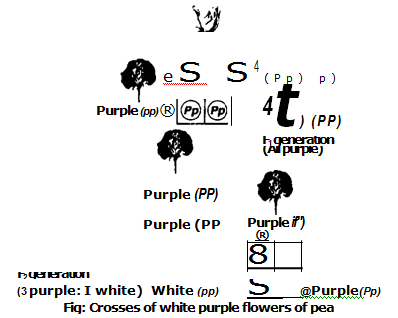 In this cross, Purple flower was crossed with white flower. In F1. all purple flowers were produced. It indicates that purple is dominant over green. F1 progeny was intercrossed. It gave typical Mendelian ration 3: I .